This week we’re taking a temporary break from video and moving on to websites! Our reading for today is Ginny Redish’s “Letting Go of the Words – Writing Web Content that Works”, and the first thing that Redish mentions in chapter 2 is that “understanding your audiences and what they need is critical to deciding what to write,” followed by a discussion about audiences. When writing for the web you need to understand who your audiences are and why they’ll arrive at your page. There are a lot of people who will visit your site, and it’s best to try and categorize and target different groups specifically. 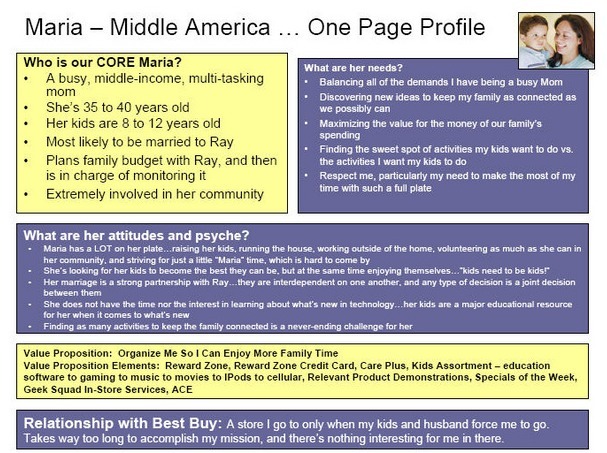 Best Buy has used this type of profiling to create personas for each of their different customer groups. In the graphic above, Best Buy lists major characteristics of “Maria,” a middle-class mom that only goes to Best Buy when others in her family force her to go. The idea being that employees can better serve someone’s needs if they know a bit of background about them. Best Buy probably created their list of personas by conducting interviews and doing research to find out what type of people visited their stores. Redish recommends that you do that same when creating web content by observing and talking to users of the site, getting feedback as they go along. Once you’ve formed personas, you should keep them in mind when designing your site. Constantly ask yourself whether certain personas will be able to find what they need or accomplish what they need to do on your site. Sometimes when you have two vastly different audiences it’s best to have two different websites rather than writing for everyone at once. Take a look at the difference between Microsoft’s Windows 8 site, their Xbox site, and their MSDN site. All of the websites feature Microsoft products, and all of them have the same general goal: to get you to spend money on Microsoft stuff. Each website has a different audience in mind, however. The Xbox website envisions a gaming audience that is there to have fun, while MSDN is all about software development, and therefore is more serious and professional. The Windows 8 website is targeted mainly towards home and small business users, but Microsoft also has a Windows 8 Enterprise website targeted towards those working in IT and large corporations. If you understand your audience, you’ll know what they want, and if you know what they want you can design your website to work like they do. Take a look at these comics and you’ll see that a lot of websites miss the bus in terms of giving people what they want.